Home Drinking The Best Summer Happy Hours in L.A. The Best Summer Happy Hours in L.A.
June Gloom is over, summer is officially here – and the days are only getting shorter – which is reason enough to knock off work early and head to happy hour. L.A. has so many options where you can drink off the day, watch the sun set, or impress a date. Here are some of our favorites right now. Chef Michael Hung’s brand new, swanky K-Town supper club was one of the most anticipated restaurant openings of the summer, and now you can see what all the hype is about for a fraction of the regular prices. If you’re not down for the $52 caviar on the dinner menu, sidle up to the bar for happy hour, where everything on the menu is $6.01 (the restaurant’s address). Crispy avocado samosas, oysters on the half shell, and tater-tots smothered with cheddar cheese. Same goes for the specialty cocktails such as the Old Fashioned and Vodka Collins. Before you go: Mama Lion has a dress code: no shorts, hoodies, baseball caps, or flips-flops. Your vegan friends have been trying to get you to come here for ages – humor them and agree to come for happy hour, then eat your words – along with a plate of nachos and carnitas that you’d never know were vegan. 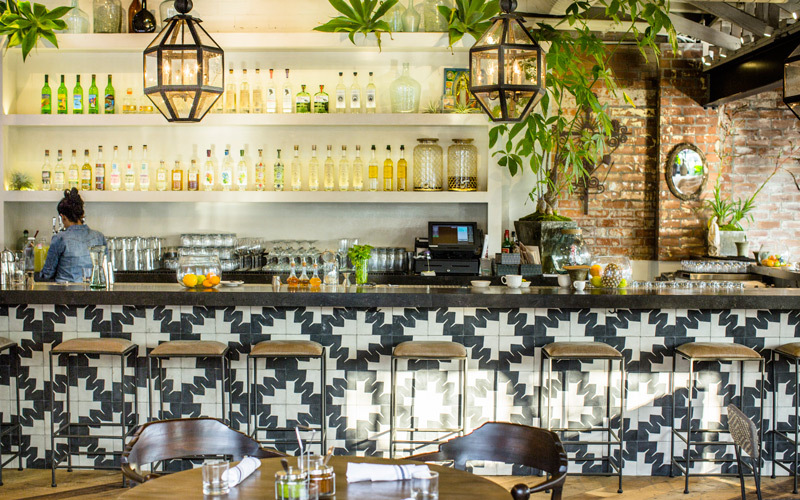 Gracias Madre might have the best happy hour setting in all of Los Angeles. Sit outside in the gorgeous, airy, outdoor dining space. Amid the trees and twinkling candlelight, you’ll feel like you’re on vacation. The food is impeccable, the cocktails superb (ask for their margarita with a spicy kick). You may spot some celebrities. Even famous people like $7 margaritas. There’s a reason why St. Felix keeps showing up on Best Of lists – the happy hour here has so many options, you could hunker down for a three-course meal and walk out of here for under $20. Mac and cheese, tamales, Portobello mushroom risotto croquettes, sliders and the aptly named “infamous” fries, along with drink specials – come on your “cheat day.” St. Felix is also home to a Sunday Happy Hour, starting at 2 PM. Tuesday – ALL DAY LONG! This landmark restaurant and saloon, with its old-school vibe, has some of the best happy hour deals around, set within a beautifully restored, historic setting. Even better? The prices: $1.50 Tater tots, fried pickles, and a slider version of the French dip they’re famous for, along with $6 Manhattans and well drinks. Insider tip: Happy Hour on Tuesday is all day long. If the sun at this hour is a little bright for you, this dark, cozy cantina with reddish glowing lights, Mexican wrestler décor, and exceptional food is just the thing. Happy Hour highlights include: $5 margaritas, $3 Tecates, $4 ceviche, $2 guacamole – and the guacamole is fantastic. If you decide to order off the Happy Hour menu, they also offer just about every tequila on the planet. Keep your eye on the time. It’s easy to lose track in here. And make sure you take a Lyft. No promises, but I’ve seen Miley Cyrus here twice. Twice. Sun Café has some of the most savory, creative and delicious healthy food – at Happy Hour they offer a smaller version of the mac and cheese that is the most popular dish on the regular organic vegan menu. Along with $5 nachos and $2.50 lettuce leaf tacos, enjoy a couple of $5 beers and know you don’t have to feel too guilty about any of it. The 14 Best Places to BYOB in L.A.